April 18 - School Spirit Day - We all wear Blue or Green to celebrate Earth Day! Are you in a band? Do you want to participate in PS 154's (somewhat) annual End-of-Year Parent Band Night? If so, please get in touch with Rachel Warren. The event will take place in mid-June at a venue to be determined soon (likely Union Hall or somewhere close), and you'll likely be sharing a stage with such luminaries as Charles Bissell from the Wrens, Palomar, and possibly Bambi Keno and White Collar Crime. Come out from under your rock — to rock and raise money for PS 154! Give us your honest opinion. Your feedback helps improve our school. Complete the Survey online in five easy steps! Contact Debby Wattenbarger at dwattenbarger@schools.nyc.gov with questions. For help getting an access code, call 1-877-819-2363. Rates of anxiety among young people in America have been increasing steadily for the past 70 years. Does your child have anxiety? In this workshop, former 154 parent Neil Weintraub, LCSW, will help parents identify signs of anxiety in children and discuss short-term relief and long-term solutions. He will help parents distinguish between common stress/worry and clinical anxiety. He will also help parents to identify ways in which they unknowingly put pressure on their children and discuss strategies for changing the dynamic. Neil Weintraub works with children to help them develop an age-appropriate understanding of their challenges and utilize their strengths to make a plan. He specializes in children and adolescents struggling with anxiety, depression, learning disabilities, ADHD, autism spectrum disorders, and general social difficulties. Neil sees clients individually and in social skills groups designed to help children with real-world social interactions. He is also the social worker for the ASD Nest Program at PS 32 in Brooklyn. 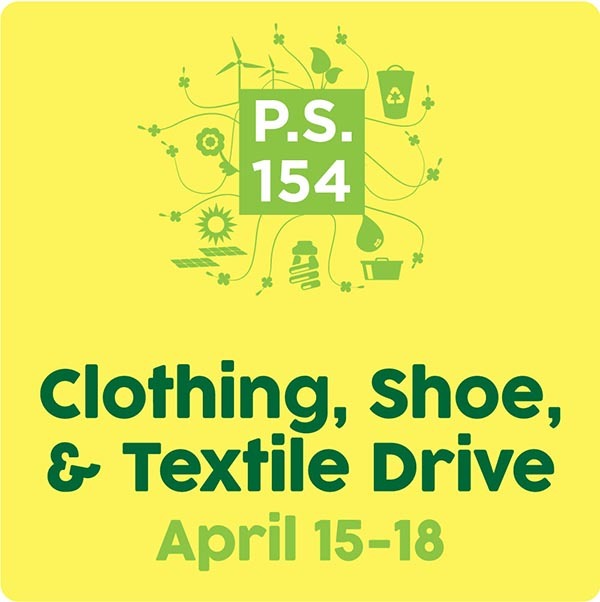 During the week leading up to Spring Break -- not to mention Earth Day -- we will be collecting textiles for reuse and recycling. Help keep textiles out of the waste stream and raise money for our kids a the same time: The PTA earns a dime on every pound collected. If you have any clothes, shoes, sneakers, hats, linens, towels, handbags, and belts that no longer spark joy, bring 'em in! Note that we can't accept fabric scraps, rugs, comforters or pillows. Donation bins will be located in the MMR. Apply Now for Exciting STEM Enrichment Programs for Summer! Students entering kindergarten through grade 12 in September can apply now to attend exciting summer STEM enrichment and experiential learning programs. A wide range of programs are offered at the NYC Department of Education’s Genovesi Environmental Study Center and NYC Center for Aerospace and Applied Mathematics; the Bronx Zoo; Central Park Zoo; Cooper Hewitt, Smithsonian Design Museum; Intrepid Sea, Air & Space Museum; MakerSpace NYC Futureworks; Museum of the City of New York; New York Aquarium; New-York Historical Society; Prospect Park Zoo; Queens Botanical Garden; Queens County Farm Museum; Queens Zoo; Staten Island Museum; Staten Island Zoo; and Wave Hill. Students will meet and work with field experts in programs that feature real life, hands-on learning experiences. Discover almost any STEM topic under the sun! Don’t miss out, spots are limited and the application deadline is Friday, April 5. Preference is given to students who attend Title I schools. Download our flyer, learn more, and apply now to investigate, design, and create with us this summer. For questions, contact Camps@schools.nyc.gov. Free workshop about Individualized Education Programs (IEPs). Location: UFT Brooklyn borough office at 335 Adams St., 25th floor, rooms A and B. Breakfast will be served, and children are welcome.